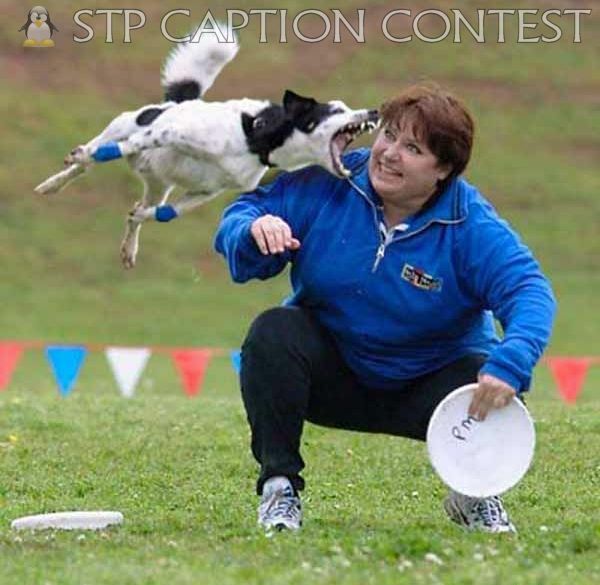 And now it gives me great pleasure to announce the winner of the December Caption Contest. Whoa! Those are some crazy-looking gills! Congratulations to Helena Fortissima for her fish-tastic entry. You can see the other entries by scrolling down to the comments section on THIS page. Thanks to everyone who entered way back in December. It is because of you that we keep doing this. For the last time, WHO left the bath salts lying around?! Fido's trying to rip off my face again! Those pesky disc golfers had been warned about trespassing on old man Haggerty's land. You stupid mutt! You didn't floss this morning..